And are less likely to let the world know about how he sometimes gets up on the table in search of a stick of butter or an unguarded box of Entenmann’s Cheese Danish. It’s easy to look at the artfully crafted lives that our friends, acquaintances, and people we haven’t seen in 20 years are presenting on social media and think, “Um…are everyone’s lives more amazing than mine?” Spoiler alert: they’re not, and this is the idea behind Sophie Kinsella’s latest novel, My Not So Perfect Life. 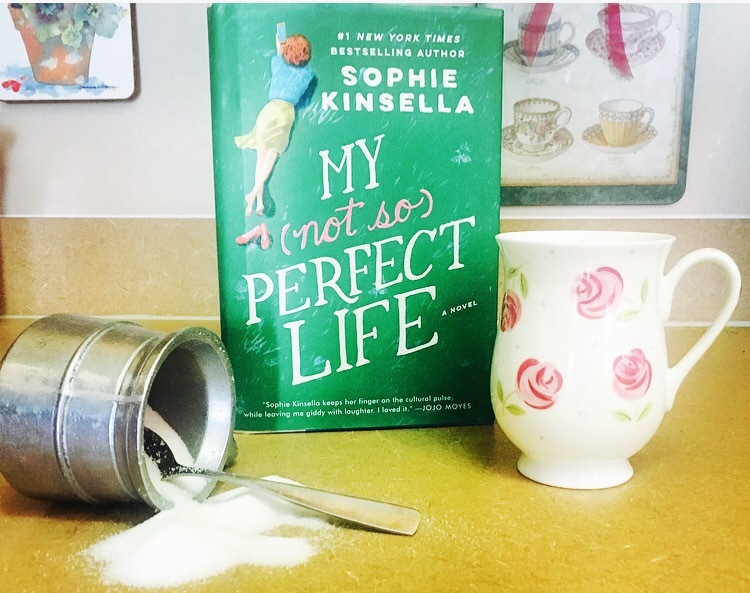 My Not So Perfect Life introduces us to Katie Brenner, a country girl living the life she’s always dreamed of in London—or that’s what she wants her Instagram followers to think, anyway. In fact, she’s living with some quirky (to put it nicely) flatmates, she’s the lowest woman on the totem pole at work, and the only thing keeping her warm on her nightmarish commute is the Christin Bior coat she bought at a flea market. Her life is not nearly as fabulous as her boss Demeter’s, who has a family straight out of a glossy catalogue, a home that should be on HGTV, and a flawless wardrobe that fits her high-powered position. When Katie is unceremoniously fired, she returns home to Somerset where she helps her father turn the family farm into a glamper’s paradise, but just as she begins to feel that her old life in London is a lifetime away, Demeter and her picture-perfect family arrive. Will this be Katie’s opportunity to exact revenge or will she learn that Demeter’s unfiltered life is even less perfect than her own? Filled with the humor, wit, and heart we can always count on in Sophie Kinsella’s novels, My Not So Perfect Life is a brilliant collage of secrets and unlikely friendships that will have you looking at the photos in your newsfeed in a whole new light. Sophie Kinsella has been one of my all-time favorite writers for over a decade and a half, and every time I pick up one of her books I’m reminded of why. As with all of her other novels, My Not So Perfect Life had me laughing out loud from page one, with hilarious observations and madcap adventures at every turn. Sophie has a knack at creating unforgettable characters (like my fictional bestie Becky Bloomwood and her dreamier-than-dreamy husband, Luke), and Katie, Demeter, and the cast of lovable goofballs surrounding them are no exception. I never once knew which direction the story was going to go in and loved how, much like a heavily filtered Instagram photo, nothing was as it seemed. Best of all, under all of the humor (and there is a lot of really good humor—so much so that you may find yourself making a spectacle of yourself if you’re reading in public), this is a novel packed with layers of emotion, and it says a lot about the social media-obsessed culture we live in. It’s a novel of how we want the world to see us, how we see other people, how we see ourselves, and the blurry lines that intersect and often contradict all three. I loved this book from front to back just as it was, no Clarendon, Lark, or Crema filter needed. If you’re looking for a truly delightful read to escape into, pick up My Not So Perfect Life. You may just devour it in one sitting, and it will be so much tastier than the perfectly plated #instafood your best friend from third grade just posted. Blogger’s note: I read this book two months ago, but am only getting to review it now. Why? 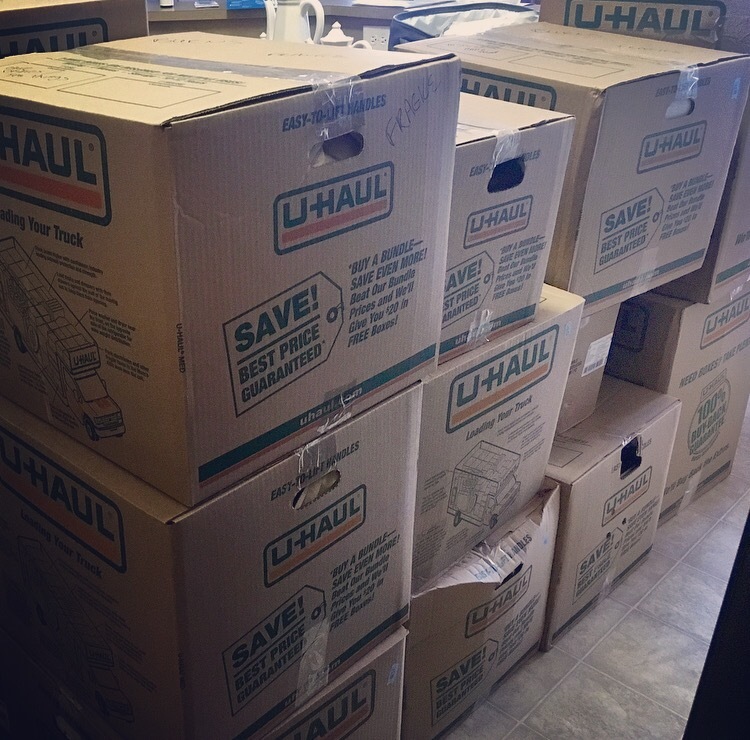 Because I’ve been in the middle of a move, and this is what my not-so perfect life has looked like for what feels like an eternity. The good news is that I’m finally ready to get my blogging groove back, so stay tuned for lots more Book Perfumey fun! For more on the sparkling, talented Sophie Kinsella, visit her website and be sure to follow her on Facebook, Twitter, and Instagram! And if you have a not so perfect snapshot of your life to share on Instagram, tag #mynotsoperfectlife and you might just be featured on the My Not So Perfect Life page! What a fantastic review! This book sounds wonderful! 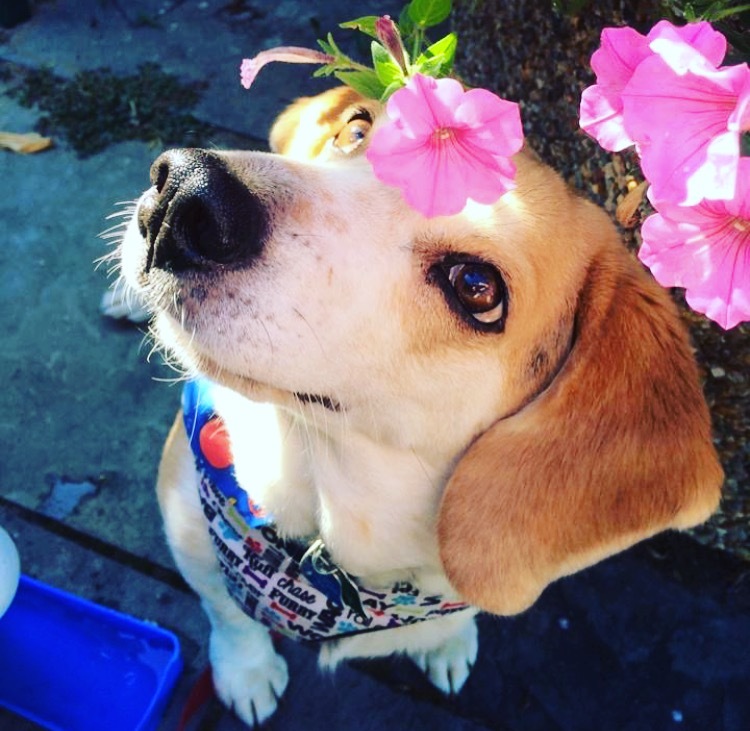 A beagle on the table? Does he think that he’s a cat? Thank you!!! He thinks he’s the BUTTER BANDIT!